During her lifetime Mary Shelley (1797-1851) was considered a minor player in the colourful lives of the Romantic poets, but her literary legacy has overshadowed them all. For every contemporary reader who admires the poetry of her husband, Percy Bysshe Shelley, or their friend, Lord Byron, there are millions who have thrilled to the story of Frankenstein. The monster Mary created has become one of the great icons of modern popular culture – and not just western culture, as shown by the success of Ahmed Saadawi’s 2013 novel, Frankenstein in Baghdad. This year is Frankenstein’s bicentenary. The story began life one stormy night in 1816, in a mansion on the shores of Lake Geneva, when Byron suggested to the Shelleys and his friend, Dr. Polidori, that they shoud each write a ghost story. Mary’s novel would be published two years later in an edition of 500. The story owes its enduring popularity to its many adaptations for stage and screen, notably James Whale’s Frankenstein of 1931, with Boris Karloff in the title role. The movie followed the author’s lead by portraying the monster in a tragic light as a hapless outcast rejected by his creator, who yearns for acceptance but turns in despair to violence. Critics have seen the novel as an implicit criticism of the racist attitudes that allowed the slave trade to flourish. It has also been read as a comment on the hypocritical morality that penalised non-conformists such as the Shelleys and her famous mother, Mary Wollstonecraft, who wrote the pioneering femininst tract, A Vindication of the Rights of Women (1792), and died 10 days after giving birth to Mary. This only scrapes the surface of a tale open to a huge variety of interpretations, but Mary Shelley knew what it felt like to be ostracised and reviled. She ran off with Percy when she was only 16, and found herself rejected by her adored father, William Godwin, even though she had only acted on the free-thinking principles he had espoused in his book, Political Justice (1793). Haifaa Al-Mansour, the director of this Mary Shelley bio pic, also knows what it’s like to defy convention and put oneself at risk of public censure. Al-Mansour is the first female fillmmaker in Saudi Arabia, a country so rigidly patriarchal that it issued driving licences to women for the first time only last month. Her debut feature, Wadjda (2012), told the story of a ten-year-old girl in Riyadh who longs for a bicycle. The difference between a small, incisive movie such as Wadjda and an full-blown historical romance is a bit like the gulf between Sofia Coppola’s Lost in Translation and her follow-up, Marie Antoinette. The casual brilliance of the first film was completely absent from the second. Mary Shelley is not a a train wreck like Marie Antoinette, but it veers dangerously close to melodrama, if not soap opera. The film begins with teenage Mary (Elle Fanning) and her step-sister Claire (Bel Powley) being brought up in a Holborn bookshop, by their kindly father, William Godwin (Stephen Dillane) and wicked stepmother (Joanne Froggatt). It ends with the publication of Frankenstein in 1818. This is a period of no more than five years in which Mary would elope with Shelley and Claire, lose three children, and write one of most original and enduring novels in the English language. By 1822 she would be widowed, and forced to eke out a living from her writing. Elle Fanning looks young enough to play Mary, although she has none of the gravitas that impressed observers when they met Godwin’s intellectual daughter. Bel Powley, as Claire, plays a teenage sexpot, yet again. 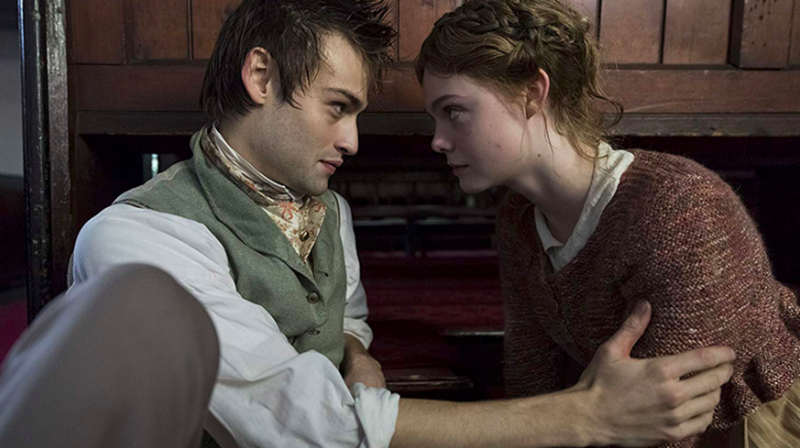 Douglas Booth is Shelley, who was such a mass of contradictions that he almost defies fictionalisation. Mary Shelley is one of those movies in the grand old Hollywood style that reshapes historical fact into a more dramatically satisfying form. Script-writer, Emma Jensen, in collaboration with the director, has taken the events of a complex life and turned them into clichés. This is to drive home the revelation that Mary was a brilliant woman in a society that treated women as second-class citizens – just in case you thought London was a feminist showpiece in 1814. In movies “based on true events” history is often mangled to emphasise some fundamental aspect of a character’s personality. For instance, when Winston Churchill takes a fictional trip on the tube in Darkest Hour, it’s meant to show us he was a man of the people. In Mary Shelley, there is an awful scene towards the end which is supposed to be a triumphant moment for the young author. But by this stage of her life, Mary was only at the beginning of her hardships. The true story of Mary’s early life was so remarkable that by mangling history – changing timelines, omitting some characters altogether – the filmmakers have only succeeded in reducing her to one-dimensionality. Mary’s romance with Shelley was not just an affair of the heart but a meeting of minds. She had an intellectual maturity beyond her years but was seduced by the adventure of freedom, at considerable personal cost. Frankenstein is the distillation of her sufferings, the story of a sensitive individual at odds with an unjust world. It’s the reason why, after 200 years, the book still speaks to every one of us with such undiminished force.